I vowed to learn to cook more cuts of meat, so when I saw beef shoulder in the market – a cut I’ve never used – I snatched it up. Beef shoulder is tough and muscular, and does well over low heat for long periods of time. Let cook as long is you can – preferably 8 hours on low. Since this beef is very tasty (and take a little bit of time…) double the quantity of meat, garlic, minced onion, bay leaf and chile to use later in the week in a beef corn soup, or another meal of your choice. Make sure to reserve liquid from the crock pot! 1. In a medium bowl, cover chiles with boiling water. Let stand until softened, about 15 minutes. Drain, stem, and seed chile, then transfer to a blender. Puree until smooth. Season with salt and pepper. 2. In crock pot, combine chile mixture, beef, garlic, onion and bay leaf. Drizzle with canola oil and season with salt and pepper and cover completely with water. Cook until tender and falling apart – at least four hours. 3. When beef is ready, shred. Warm tostadas in oven preheated to 300. 4. In a medium pan, ladle liquid from crock pot over spinach. Set heat to medium and cover. Cook til spinach is completely wilted. 5. Assemble tostadas: first, spread layer of cabbage, then pile on spinach. 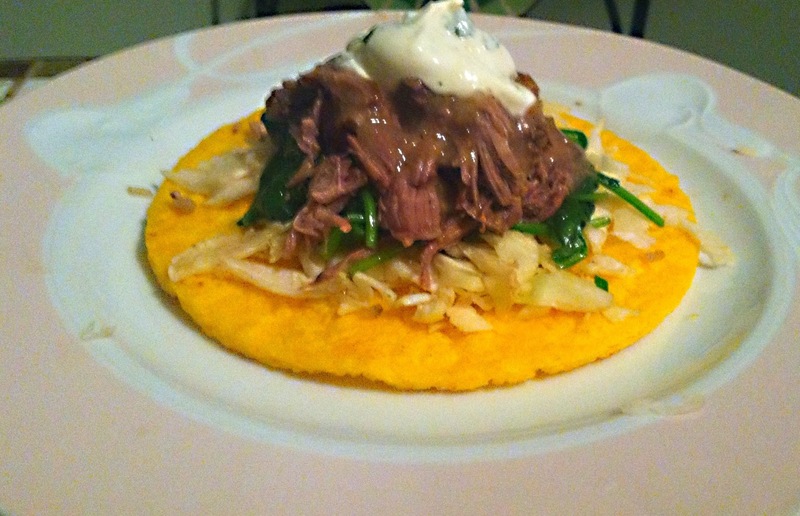 Top with shredded meat, a dollop of sour cream and a sprinkle of lime. Garnish with cilantro and and braising liquid.